Beebe and Clegg: Their Enduring Photographic Legacy, a new book from the Center for Railroad Photography and Art, tells about how partners Lucius Beebe and Charles Clegg introduced railroad photography and the world of railroading to wide popular audiences. Beebe (1902-1966) initially championed the three-quarters or “wedge-of-pie” perspective in his photography. Clegg (1916-1979) introduced a more innovative outlook, boosting creativity for both of them. Their photographs shine in this new book, produced with the best of modern digitization, design, and printing techniques. Over the course of eight chapters, the book traces Beebe and Clegg’s life and times together, their visual influences, short lines, narrow gauge lines, Nevada and the Virginia & Truckee, and their photography. The book includes 222 images from the California State Railroad Museum Library and Archives, all scanned from negatives and carefully cleaned and checked, revealing surprises. Many are previously unpublished. Thirty-six additional images come from other sources. 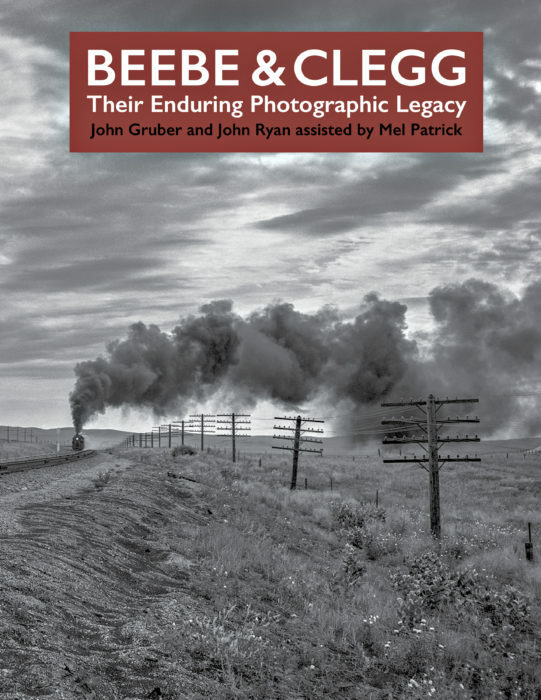 “Their legacy is larger than the publications they produced, for they demonstrated that railroads serve America as an icon of its experience,” authors John Gruber and John Ryan conclude.